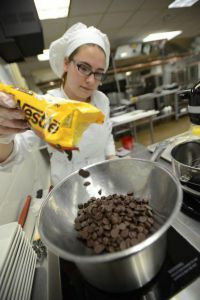 Treats from the Culinary and Hospitality Club at Pensacola State College will sweeten the Choral Society of Pensacola’s “A Toast to Summer” at 7 p.m., Friday, June 23, at Artel Gallery, 223 Palafox Place. Come to the casual event and listen to live music while enjoying Artel’s exhibition, “It’s Music to My Eyes,” sipping champagne, and sampling an array of delicacies prepared and served by the Culinary and Hospitality Club. Among the savory items on the menu are bruschetta, onigiri (rice balls), German chocolate cookies, chocolate cherry cupcakes, mini apple turnovers and salted caramel squares. Culinary and Hospitality Club members have also competed in the Great American Chili Cook-Off, earning second place in the Peoples’ Choice category, and in the Gulf Coast Kid’s House Chocolate Fest, where they created chocolate-dipped bacon and cherry basil-filled cupcakes. “A Toast to Summer” is sponsored by Bruce Baker, MBA, RE/MAX Infinity, and proceeds will support Choral Society programs and activities. Tickets are available at www.eventbrite.com and at the door. For more information, email Choral Society Executive Director Charlie Smoke at charlie@choralsocietyofpensacola.org.